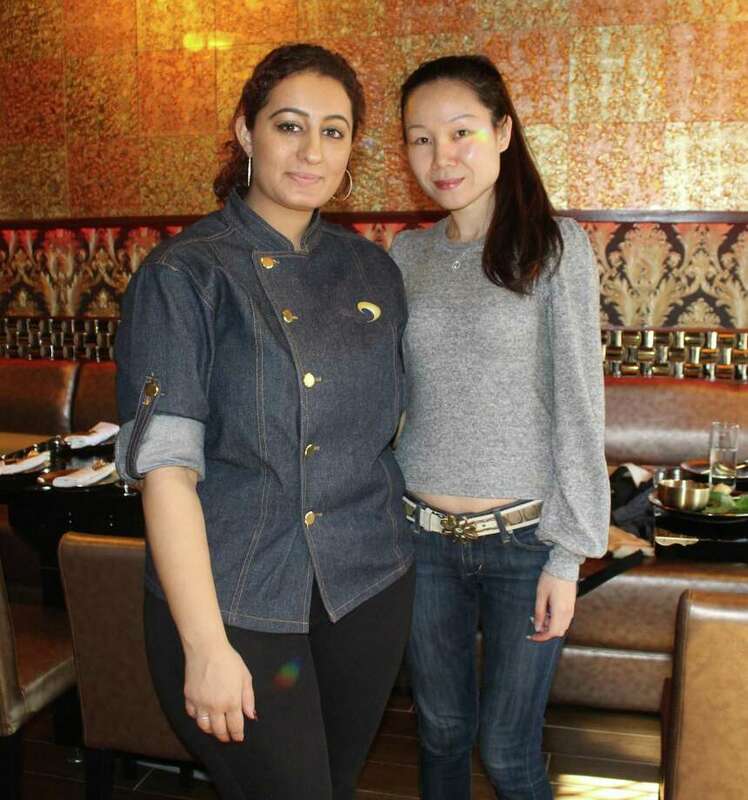 Elaine Chen, right, co-owner with her husband Simon Chen, of Wafu, a new Korean barbeque restaurant in Westport, stands next to Fay, a waitress there. WESTPORT — Tucked in Bedford Square is a new Asian restaurant specializing in Korean barbecue. Opened in November, Wafu Asian Bistro is Elaine and Simon Chen’s second restaurant. The couple, who emigrated from southern China to Manhattan together in 1997, also own a restaurant in the Southport section of Fairfield with the same name as the new Westport bistro. The Fairfield Wafu, established six years ago, serves primarily Chinese food and sushi, but the Westport shop is more Korean-food oriented and will not have sushi, Elaine said. “When we moved to Manhattan, we fell in love with Korean barbecue and thought it was something different and fun and healthy, and that it would be cool to have a restaurant with that type of food,” Elaine said. The Chens moved to Connecticut in 2007 and saw the state as fertile territory for Korean barbecue, especially as the cuisine’s popularity grew in nearby New York City and New Jersey. Wafu’s Korean barbecue entrees are cooked directly in front of the guest and can include a variety of meats, from pork belly to filet mignon to beef, chicken or shrimp. However, while Korean barbecue may be the flashiest item on the menu, Elaine said she is most enthusiastic about a more modest dish she expects to be a staple of the new shop: the poke bowl. “It’s a good lunch and healthy with the poke bowl,” Elaine said, noting the dish is only available at the Westport Wafu. A modest-sized cup filled with rice, mango, avocado, egg, seaweed and a choice of meat or seafood, the poke bowl is a dish Elaine hopes will appeal to the health-conscious Westport clientele. Like the acai bowl trend of the past few years or the Bento boxes that have newly filled the shelves of town’s Aux Delices foods, the poke bowl satisfies both taste and the waistline. “People want to try new things right now,” Elaine said. The Westport Wafu will not offer takeout or Uber Eats like the Southport location, but with the bright windows and warm golden walls, many may find it worth leaving home to eat at the Westport location, which also serves noodle and an array of appetizers, such as honey walnut shrimp. In downtown Westport, populated mainly by clothing and furniture stores and a few upscale restaurants, patrons say Wafu appears to be a welcome addition. Bonnee Pecquez works at a company downtown and was enjoying lunch with a co-worker at Wafu a few days after it opened, and said she was grateful for the new option. “You get tired of going to the same places. When you work here everyday, it gets boring. We’re really happy,” Pecquez said.